When a filmmaker bases a movie on his own life, sometimes it hews so closely to those experiences that the film loses its elasticity, even if the writer-director attempts to avoid this trap by toying with timelines and using flashbacks as tools to tell his story. Fortunately for Mike Mills, Beginners has been blessed with performers who make his movie memoir stretch beyond the limits of his biography, but the cast only can do so much to overcome its overabundance of silly quirks on what could be a touching, human story all the way through. 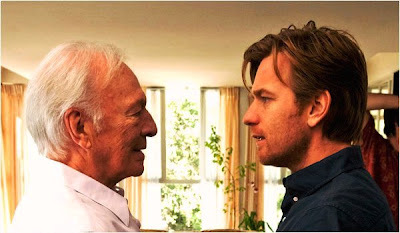 Ewan McGregor stars as Oliver Fields, a graphic artist recalling the day shortly after his mother's death when his 75-year-old father Hal (Christopher Plummer) admitted to him that he was gay and had been during and before his 45-year marriage to Oliver's mother Georgia. Oliver's recollections come bubbling forth as he cleans out Hal's house after his passing from cancer several years after losing mom. On a parallel track in the "current" time period (which sticks so closely to Mills' own that it must specifically take place in 2003), Oliver attempts to forge his first lasting relationship with an equally commitment-phobic French actress named Anna (Mélanie Laurent, Shosanna in Inglourious Basterds). Their initial meeting ventures beyond being a meet-cute and veers perilously close to a meet-puke as Oliver and Anna encounter each other at a costume party where he's dressed as Freud and she has laryngitis. Plummer alone probably caused the torrent of praise poured upon Beginners and while he's good, the veteran actor doesn't deliver the performance of his lifetime either. It would be news if Plummer turned in a bad performance (not that he hasn't showed up in turkeys — I remember him as the cartoonish bad guy in the 1987 spoof Dragnet with Dan Aykroyd and Tom Hanks). He's perfectly fine in Beginners, especially in the scene where Hal describes to his son what it was like to be a gay man in the 1950s and how Georgia knew and promised she could "change him." That scene aside, I'd still rank Plummer's Oscar-nominated role as Tolstoy in The Last Station and his criminally neglected work as Mike Wallace in Michael Mann's The Insider higher on his lengthy filmography. The performer I didn't recognize and whose character I would liked to have seen more of was Mary Page Keller (whom I recall from the early Fox comedy Duet) as Oliver's mother Georgia in flashbacks when he was a child. Her scenes contain just the right amount of cleverness before they wear out their welcome. Too often, that's what hinders most scenes in Beginners. Early on, McGregor gets to deliver a funny scene when he inherits his dad's Jack Russell terrier Arthur (Cosmo) and explains to the dog the history of his breed and how they're all trained now to act overly cute in television and movies. That could have remained a humorous memory — but then the movie uses Arthur the same way it accuses other entertainment works of doing by not only cutting to him for expressions but giving him subtitled dialogue as well. Mills' film Thumbsucker turned out relatively well, but that was based on a novel someone else wrote. Perhaps Mills should stick to movies that stem from someone else's material to give him appropriate distance.